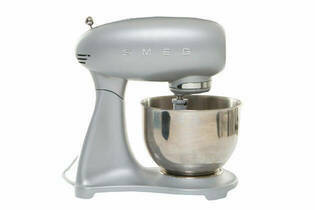 Snapshot: The Smeg 50s Style Stand Mixer SMF01 has a 4.8L bowl and comes with a whisk but no scraper-beater. How well does it beat, mix and knead? OK results in our mixing (cake batter) test. Excellent results in our kneading (dough) test. Can add optional accessories that attach to the motor of the mixer. Just OK results in our beating (egg whites) test. The motor head isn’t spring-loaded (so you need to hold the head when lifting and lowering). No eject button for removing beater (hand can get covered in mixture). Considerable strength needed to remove bowl. Bowl has small base area so can be unstable on the bench.